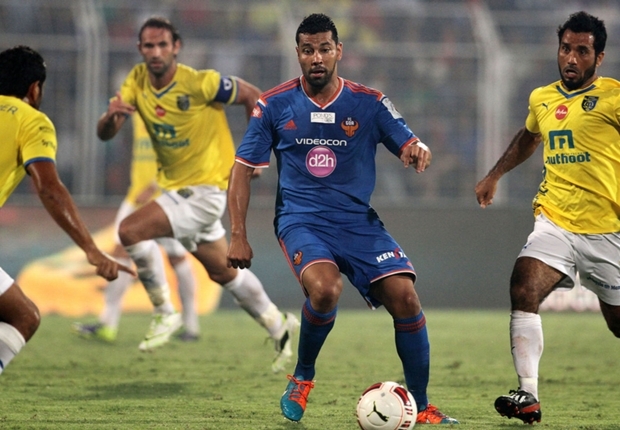 Moving in third place, FC Goa beat Kerala Blasters in ISL. Indian Super League team FC Goa beat Kerala Blasters comprehensively with a 3-0 victory at home on November 26, 2014. The Virat Kohli co-owned team beat the Sachin Tednulkar co-owned team to take the third spot in the league standings. The two teams are currently on 15 points each after 11 games, but Goa has a higher goal difference. The first half of the match was rather dull match with no goals being scored. The first goal was netted by the substitute Miroslav Slepicka in the 63rd minute. Following that was an effort from Andre Santos int he 69th minute. Only 10 minutes later, Slepicka doubled his goal tally as he drove the ball in the back of the net. The score would have been much higher if it were not for the Kerala Blasters’ keeper David James, who made some handsome saves to restrict the score to 3-0. Andres Santos of FC Goa was adjudged the man of the match. After a shaky start, Goa settled down and began attacking, but two great saves from David James denied them a goal in the first half. As the race to the semi final grows closer, the pressure will be amped up on teams to perform. The top four teams will qualify for the semi-finals and Pune City FC and Mumbai City FC are still in the fray.